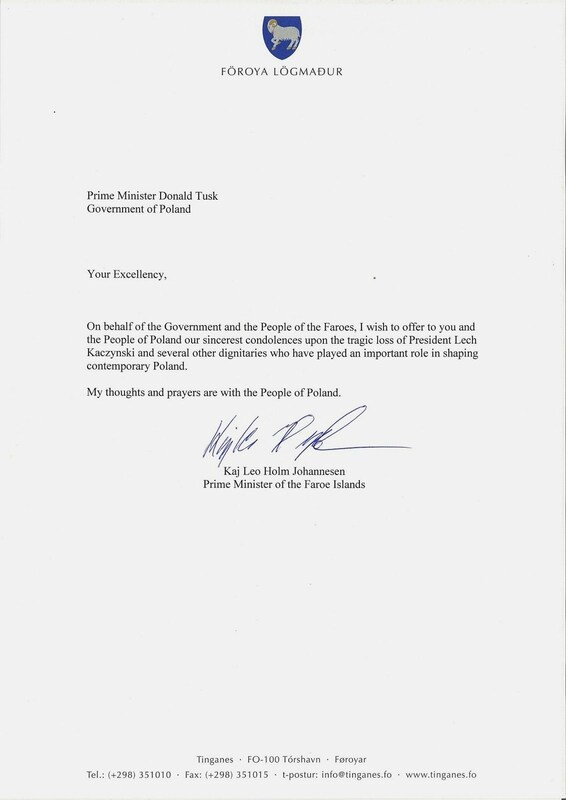 As wrote Portal.fo, Prime Minister of the Faroe Islands, Kaj Leo Johannesen, expressed the heartfelt condolences after a plane crash killed the President of Poland Lech Kaczyński, his wife Maria and 94 other Polish people, including the army chief of staff, the navy chief commander, the governor of the national bank, leading historians, the former President of Poland in Exile, Ombudsman, representative of churches, Katyń families, other associations and seven crew. Lech Kaczyński and the many other national figures were on route to the 70th anniversary of the massacre in Katyń, where about 22 000 of Polish officers and prisoners of war were murdered by Soviet secret police in 1940. Polish presidential TU-154 plane crashed in thick fog near Katyń forest in western Russia. The Russian emergencies ministry told Itar-Tass news agency the plane crashed at 10.56 Moscow time (7.56 GMT) as it was coming in to land. A week of national mourning has begun in Poland. Thousands of people have turned out on the streets of Warsaw, placing candles and flowers at the presidential palace.